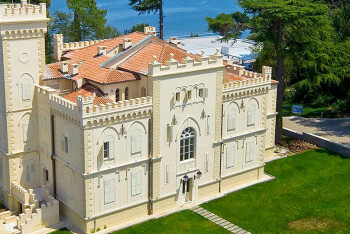 Experience the charm of the 19th century in the carefully refurbished noble family summer residence on the island close to Poreč. Enjoy the luxury and comfort of the elegant, tastefully furnished apartments with sea views. Have a stroll in the park in front of the castle and take wonderful photos of the island scenery. Relax by the nearby outdoor infinity pool with its magnificent view of the sea, and then try the delicious seafood specialities in the fine dining restaurant close to the pool. Make full use of the other services and facilities available in the resort, ranging from the beaches, pools, wellness centre, restaurants and bars, to the numerous sports and entertainment options for children and adults. Resort guests also have a parking spot and free boat transfer from the car park to the resort and back. Check-in for Castle guests is at the reception of the Hotel.